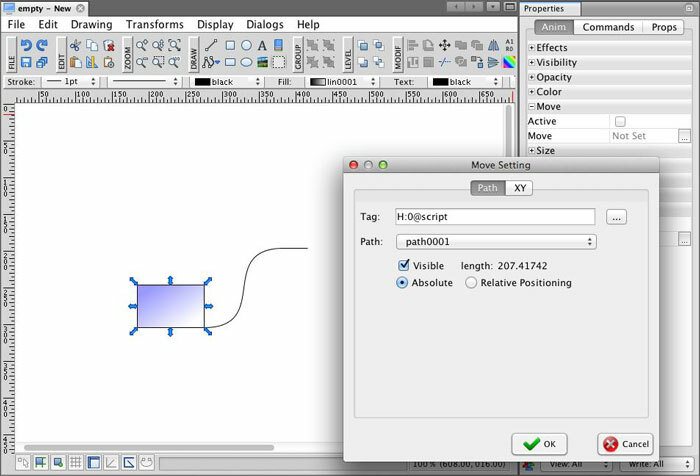 This animation is a programmed motion of an object moving along a defined path or XY axis, based on the tag value. Relative Positioning – this option allows using only a certain tag value threshold. The Min value represents the starting animation point (the object moves only when the tag value reaches this point); the Max value represents the ending animation point (the object moves to the end of the path when the tag value reaches this point). 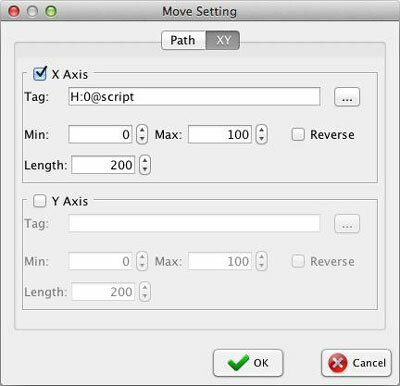 In this type of animation, you can set up movement along the X and Y axes. Check the appropriate axis that you want to move your object along and fill in the required parameters. Start by filling the Tag, Min, and Max values. Then fill in the length of the movement in pixels. If you would like to reverse the movement, check the Reverse check box. Note: A typical use of the Move animation might be moving goods on a conveyor belt, etc.